Two thousand fifteen marks the third year Mike and Melissa have enjoyed the holiday season with Abode 212 as their home base. In that time, a few traditions have been well established with a couple more finding their way into the mix. 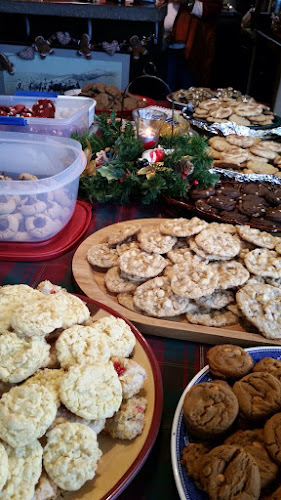 Each year, a Sunday afternoon is deemed the "Heathen Cookie Exchange" - an event for those of us who are more often found at the local bar than the local church. The event always features a healthy assortment of appetizers, a good deal of win and liquor, copious amounts of fresh baked cookies (each attendee is asked to bring 6 dozen of their favorite cookie to share with others) and loads of holiday cheer! 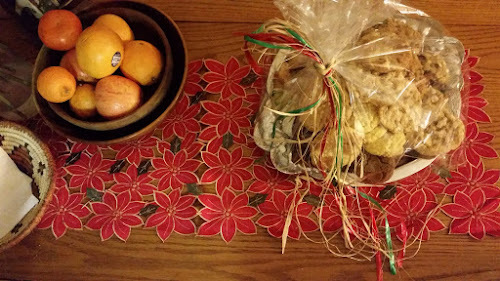 This year may have been the biggest yet: Cookies were lined out on every available surface, the infamous flaming cocktail was imbibed, bellies were overstuffed and this little community of heathen women showed-up in true fellowship format, filled with love, good-will and holiday cheer. 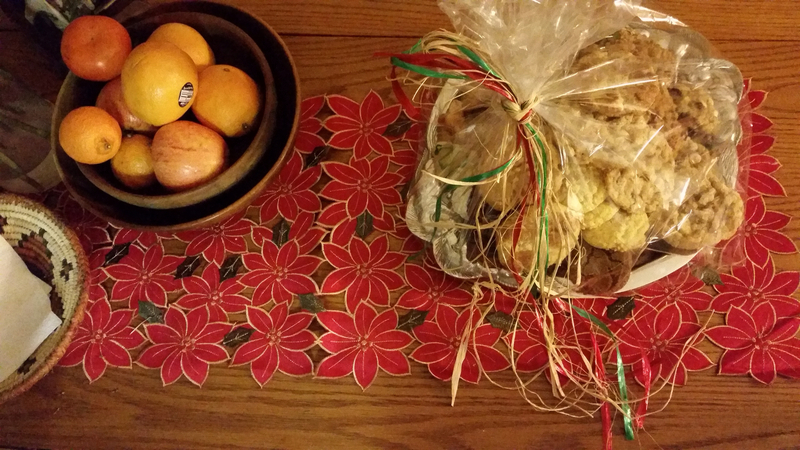 The Heathen Cookie exchange is one of the most cherished (and, ironically, long standing) Burlington holiday traditions. Other "traditions" to be described here within, are only traditions in terms of having been successful in their initial year, and therefore are now held as tentative plans and traditions for future years of Burlington living. The Hot Chocolate tradition. As a paraprofessional at the local middle/high school, Melissa was eager to offer a gift for all co-workers, but was a little less excited about going to all the work to figure out a cute gift to give. She combed her Pinterest memory and suggested to her "Resource Nook" co-workers that, as a team, they host a Hot Chocolate bar for all faculty and staff. The idea took hold and soon the team had plotted who would bring cups, hot chocolate mix, marshmallows, coffee creamers, candy canes, whip cream, sprinkles and so much more to make the event truly memorable and absolutley delicious. The day of the "teacher-lounge-hosted" event, the wind was blustery and the temperatures a bit uncomfortable, making Hot Chocolate that much more enjoyable and appreciated. Many adults enjoyed multiple cups of Hot Chocolate throughout the day (Melissa enjoyed a grand total of 6 cups of hot chocolate; that includes two on the day the hot chocolate bar experience was shared with resource room students). 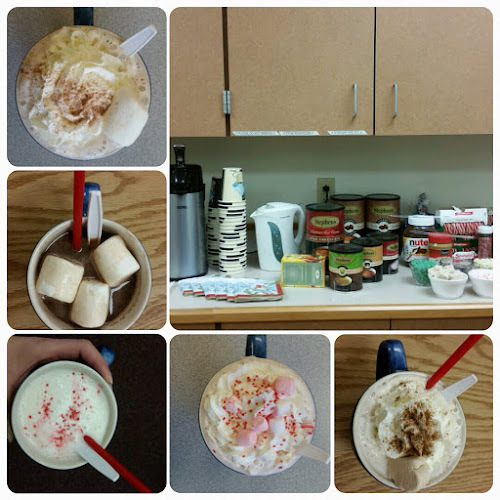 The day(s) were so much fun and the hot chocolate so incredibly delicious, that the Resource Nook decided unanimously to instate the Hot Chocolate Bar as their yearly tradition. hot chocolate + pumpkin spice coffee creamer + whip cream + nutmeg + gingerbread marshmallow = perfection! Finally, to add to the list of traditions that are yet to be traditions but are worthy or tradition status, Mike and Melissa hosted family at their home for a Christmas Eve Eve dinner of pizza (one even featured beer-battered pheasant from a pheasant Mike shot earlier that day!) and beer, games, chatting and puzzling. Morning rolled around and had everyone enjoying Brunch Sliders and a Bloody Mary Bar (using nothing less than the infamous infused vodka straight from The Burlington Place). As family slowly departed to prepare for traditional-tradtions of Christmas Eve, Mike made a quick offer to wear out the dog--nieces with a bit of hunting. 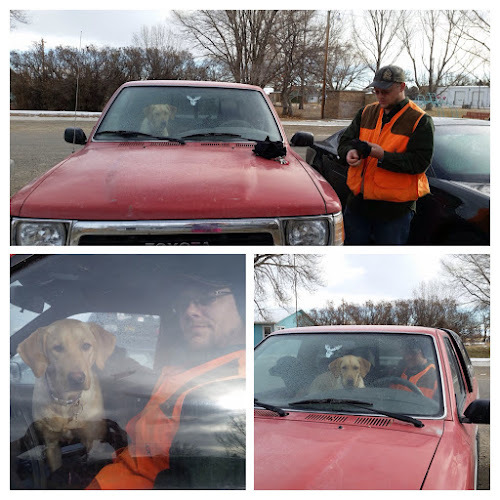 Upon returning, the dogs and man were sufficiently exhausted and the rest of the crew at Abode 212 was set to head on to Worland and prepare for the continuation of Christmas traditions. 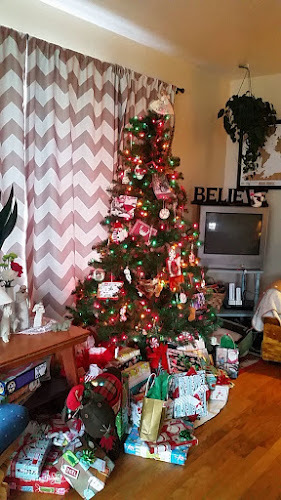 Having the chance to fill Abode 212 with family twice during the holiday season was a true joy for Mike and Melissa, to the point they are plotting future opportunities to invite their loved ones into the whole of their Burlington life, not just the work part of their Burlington life.